You'll be £12.00 closer to your next £10.00 credit when you purchase German Reconnaissance and Support Vehicles 1939–1945. What's this? Order within the next 26 minutes to get your order processed the next working day! 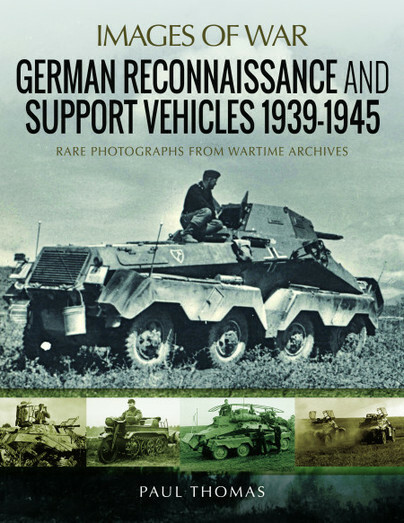 The Wehrmacht used reconnaissance and support vehicles widely in the Second World War and this book sets out to show the full range of both categories using over 200 rare images and descriptive text and captions in true Images of War Series fashion. Both tracked and wheeled vehicles were employed for reconnaissance and screening. These included light tanks mainly comprising of the Pz.Kpfw.I, armoured cars such as the six and eight wheeler Sd.Kfz.231,232,233,234 and its variants, 263, the Sd.Kfz.221,222,223,234 and 247, motorcycles such as the famous BMW R75, the Zundapp KS750. In addition to their recce role they would, when possible, engage similar or light units. Support vehicles such as the tracked Sd.Kfz.2 Kettenkrad, and the renowned Sd.Kfz.251 halftracks were used in the follow-up role, frequently with mounted grenadiers to mop up over-run enemy positions. Includes some interesting tactical advice. A really interesting and very complete documentation. One of the latest in the excellent Images of War series which describes the pivotal role that German reconnaissance vehicles played in their Blitzkrieg tactics and the constant challenge faced by designers to achieve the right balance between "the holy trinity" of firepower, protection and mobility characteristics in vehicle design. By the end of the war the crews of German reconnaissance vehicles were increasingly used to support their armour in defensive roles and crews, who by then were preoccupied with personal survival, found themselves outmatched by Allied anti-armour weapons. This is a very clear and succinct account of this key wartime component of German operational capability which is immeasurably enhanced by a large number of outstanding and scarce original black and white photographs. Highly recommended. There are lots of details to be gleaned from this collection of images for the military modeller, with camouflage and markings over the course of the war, detail on stowage, uniforms, weathering as well as useful diorama ideas.